« What will drive mobile adoption in Healthcare? Like other industries, healthcare industry can also avail several benefits by adopting the latest information technologies. A constant increase is also noted in the number of primary care physicians who are adopting digital medical records. Most physicians, nowadays, use core health IT functions to write e-prescriptions, order lab tests electronically, and access clinical decision support and patients’ personal health information. But several reports have highlighted how the digital divide persists in the healthcare industry between the large and small physicians. Several top physicians have further urged the health IT vendors to eliminate the digital divide by providing standardized healthcare products and services. Each vendor must consider a number of measures to encourage adoption of electronic health records (EHT) and similar health IT solution by bridging the digital device. The poor performance of the patient portals often creates digital device. Most physicians allow patients to use the portals only to view the information. But the patients lack the option to add or update the displayed information. However, several studies have highlighted that health IT adoption can be enhanced by through an aggressive marketing strategy for PHR enrollment. Along with making the patient portal accessible to more users, the strategy will further enable patients to keep their information up-to-date. The consumer adoption of EHRs can also be enhanced by concentrating on a number of non-technology-based factors including health literacy, computer competency and internet access. The lack of emphasis on these areas will make the health IT solutions accessible only to limited users. The physicians must explain the benefits of adopting HER to patients, and encourage them to use the system. At the same time, each patient also needs to learn how to search for his personal health information, add fresh information, and share the data. Most clinics use comprehensive health IT solutions to perform several functions without investing in additional tools. These solutions make it easier for patients to access their health information, while reducing the clinic’s administrative expenses. But the systems create digital divide when patients switch from one physician or clinic to another. As the health IT systems used by individual clinics vary, the comprehensive system fails to meet the patient’s requirement. So organizations must adopt custom solutions for each function. The multiple applications will make their personal data easily accessible to patients. At present, there are not standard rules for building health IT solutions. But the health IT vendors must adhere to a number of common principles for online PHR development. The practice will result in making the system more accessible and interoperable, while providing enhanced data security and consumer control. As the users have option to access their personal health records through a common technology like the Internet, it will the standardization will make it easier for them to switch to the new medium. The use of a common technology to access information will further reduce the digital divide. 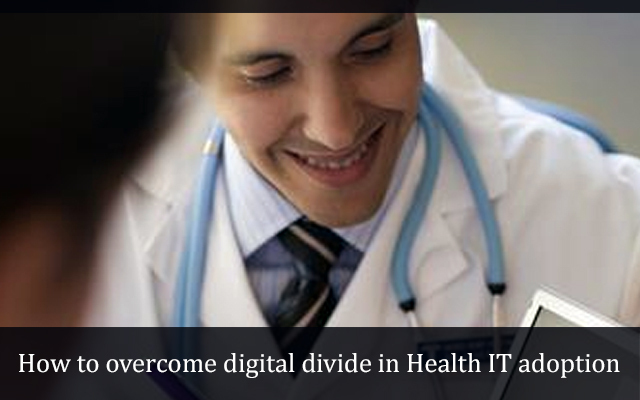 The frequent changes in the behavior of consumers also affect the digital divide in health IT adoption. At the same time, the consumer behavior is also impacted due to health IT adoption. For instance, an individual can stay healthy by changing some of his regular behaviors like diet, exercise and tobacco consumption. The health IT vendors also need to explore ways to observe the behavior of a group of consumers by optimizing the system for a group setting or social network. The Internet-based PHRs can be further integrated with social networks to constantly track the changes in consumers’ behavior. Also, the integration will encourage more consumers to adopt health IT solutions. In order to eliminate the digital divide in the health IT adoption, the Health IT vendors must share their best practices. The sharing of information will make it easier for different vendors to build health IT solution by adhering to certain standards and practices. You can get in touch with medical software development companies to get your software developed. There are companies which have the expertise to develop electronic medical records and other healthcare softwares. If you would like to hire healthcare software developers from such a company, we would be glad to assist you at Mindfire Solutions. This Post was posted in Health Care and tagged customized cpoe systems, Develop Electronic Medical Records, develop hipaa compliant patient portals, Develop medical practice management software, healthcare software development, healthcare software maintenance, hire healthcare software developers, Medical Software development, mobile health app development. Bookmark the permalink.